I've talked at length about how strange it is that a franchise born out of pure confusion and desperate measures has come to be one of the biggest if not the most long-running series that performs as consistently as these Fast & Furious films do. One can't help but to wonder if the franchise would feel more in a state of fatigue were it not for the tragic and rather shocking death of Paul Walker in the middle of production on the seventh film, but with the eighth film in the franchise it seems Dominic Toretto and his gang are moving on to different terrain and by that I mean both in terms of physically as well as in story. I guess I somewhat artlessly assumed that the beginning of the "final" trilogy in this ever-expanding brand would more or less follow the beats of those that had come before it meaning Dom and his gang would get roped into an elaborate mission that requires their particular set of skills to stop a new villain of the week, this time played by Charlize Theron. 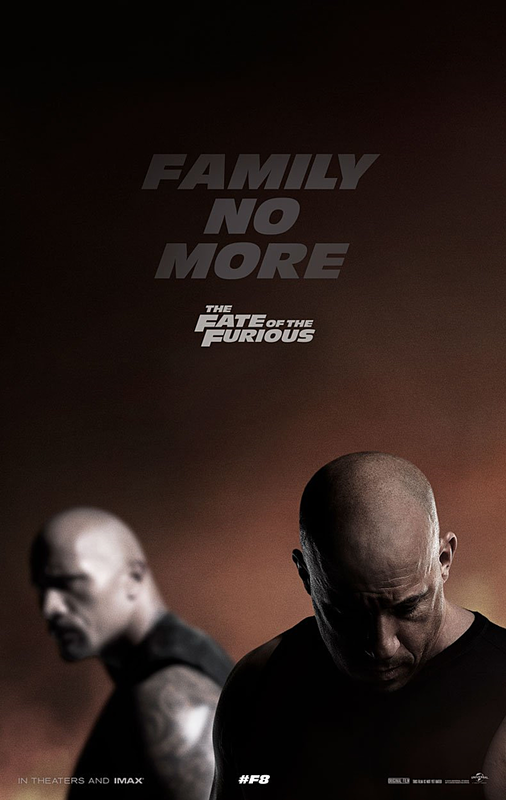 I assumed wrong as from the opening moments of this over three-minute trailer it's clear Vin Diesel's Toretto is no longer the man that holds family above all else. In fact, he goes full rogue here not only betraying those he once called family, but actively dismantling them forcing the remaining members of his crew in Letty (Michelle Rodriguez), Tej (Ludacris), Ramsey (Nathalie Emmanuel), and Roman (Tyrese) to team-up with The Rock's Hobbs and former enemy Deckard Shaw (Jason Statham) in order to take him down. This is an interesting way to kick off this new phase in the Fast & Furious story and I look forward to seeing what twist series screenwriter Chris Morgan has come up with to justify Dom's sudden turn. All of that said it should also be noted that new to the franchise director F. Gary Gray (Straight Outta Compton) has seemed to certainly add his own flavor to the mix as not only are the stunts on par with the stakes the team seems to be facing, but there is an undeniable rhythm to it all that hopefully plays through the entire runtime of the final film. The weirdly titled The Fate of the Furious also stars Kurt Russel, Scott Eastwood, Elsa Pataky, Helen Mirren, and opens on April 14th, 2017. Synopsis: Now that Dom and Letty are on their honeymoon and Brian and Mia have retired from the game—and the rest of the crew has been exonerated—the globetrotting team has found a semblance of a normal life. But when a mysterious woman (Oscar® winner Charlize Theron) seduces Dom into the world of crime he can’t seem to escape and a betrayal of those closest to him, they will face trials that will test them as never before.